Had another look at the first retreat. Covered in 1mm translucent young. Again went to get camera but when returned they had retreated inside! Added by Gareth Mills at 13:38 on Sat 18th Jul 2015. Saw this spider with its retreat this morning. It came out and clobbered a black ant. 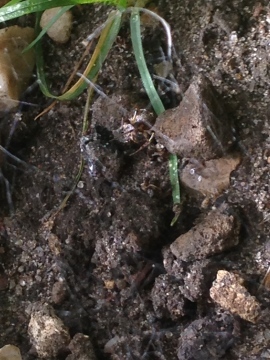 Have also found another retreat in the garden so it looks like there is a colony!